Home / Major and Minor in First Nations and Endangered Languages! The Institute for Critical Indigenous Studies in the Faculty of Arts at the University of British Columbia is delighted to announce that the undergraduate Major and Minor in First Nations and Endangered Languages (FNEL) have been officially approved by the BC Ministry of Advanced Education, Skills & Training. Coinciding with the UN’s International Year of Indigenous Languages, this announcement marks the realization of a long-nurtured vision held by FNEL program faculty, staff, students, and community partners, especially the Musqueam Nation, with whom FNEL has shared a world-recognized language revitalization, documentation, research, and teaching partnership for over two decades. FNEL offers courses at all levels in methodologies and technologies for endangered language documentation, conservation, and revitalization along with university-level classes in First Nations language learning. 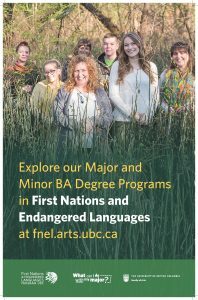 Students graduate with contextually-rich and ethically-situated training in language reclamation and sustainability, and now they can officially declare FNEL as their Major or Minor of study at UBC. Interested students can learn more through the FNEL website fnel.arts.ubc.ca/undergraduate/requirements/. For additional information on declaring your FNEL Major or Minor, please contact the Institute for Critical Indigenous Studies at cis.arts@ubc.ca.